The Dolphin and porpoise are powerful symbols of emotion and change. Dolphins live in groups of up to 100 individuals. Females give birth to a single young. Several Dolphins surround her to assist with the birth. They will pull the newborn out by its tail and protect it from harm. Injured and sick Dolphins are cared for by others who will lift them to the surface to breathe. Dolphins spend large portions of their day playing. They live their life in joyful harmony with each other and their world. They seem to have learned the lesson that love is the most important part of life and can teach those with this totem how to love themselves and their world more. The power of Dolphin is community in balance. 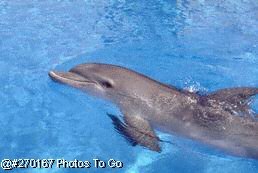 Dolphins use a variety of clicks, whistles, grunts and body postures with which they communicate. Each Dolphin has an individual whistle that it calls itself, and it uses other Dolphin's personal whistles to call their attention. Those with this totem would benefit from some form of work or activity that uses the voice as a healing or communicative tool. Some people believe that Dolphins are more intelligent than humans. They have a large brain and a great intelligence and are often associated in mythical lore with higher forms of consciousness. Dolphins have been known to inexplicably beach themselves in large numbers. Perhaps they are following a sick or injured Dolphin to try to aid it. There was a story told to me about a man who singled out a dolphin from its group and killed it. The remaining dolphins beached themselves over and over and eventually died. Dolphins have a purity of being which touches our inner nature. If Dolphin swims into your life, follow its lead and open yourself to the energy of love, harmony and balance. Express your inner truth and follow your inner joy. Dolphin asks you to return to the depths of your being and rediscover the love that you truly are.